The Dr. Oz Show demonstrating the benefits of Tamanu Oil. Dr. Mehmet Oz is an informed and supportive advocate of the safe use of effective botanical remedies. He allows ample time for the health benefits of these botanicals to be presented in a clear and positive way. The exotic isles of the South Pacific are home to a long-used traditional ingredient which is just now working its way into the US and European topical and cosmetic industries. Since the 1920’s Oil of Tamanu (Calophyllum inophyllum) has been studied in hospitals and by researchers in Europe, Asia and the Pacific islands. The results of this research are impressive. 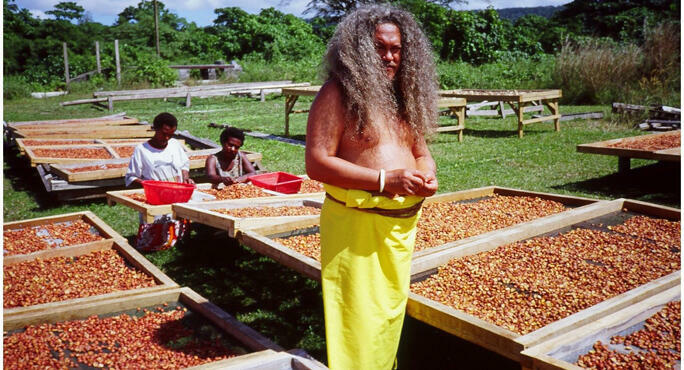 In 1999 and 2000, I travelled to the South Pacific to study the tamanu tree, and the processing of its oil, and delved into its science in earnest. This is what I learned. Calophyllum inophyllum is indigenous to Southeast Asia, but is profuse in Polynesia. The tree grows up to 25 or even 30 meters in height, with long, spreading limbs. The tree trunk is typically thick with dark, cracked bark. The tamanu branches are covered with shiny, dark green oval leaves, and small white flowers with yellow centres. The blossoms give off a delightful, sweet perfume. The fruit of the tree, about the size of an apricot, has a thin flesh and a large nut hull inside.